Hello! Did everyone enjoy the long weekend? We certainly made the (tiring) most of it and decided to wrap it up with a trip to Sonic. 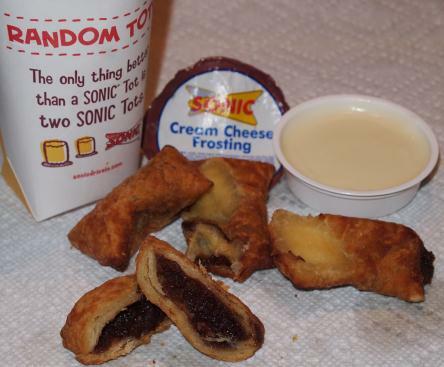 As you may know, we hit up Sonic about once a year to check on what's new. We don't usually go to Sonic because it's an hour-plus drive, but Sonic has had a habit of sending over free gift cards to sponsor the visits. Oh well, I still have a few cards left, so let's see what this trip has in store. Ok, let me get you salivating with this first shot before I start raining on the parade a bit. Now every time we've gone to Sonic, it's either been when it's cold or late, so I've never truly experienced a packed Sonic. Like "we got the last parking space" packed. What should have been a quick visit turned into a 2 hour detour on our ride home. Part of this was my fault and traffic's fault, but most of it was just super slow service. So this is the new Sonic Pretzel Dog with just ketchup... after bringing out our drinks but the wrong food order, the car hop came back with this, and why yes, it is as boring as it looks. You would think a salty hot dog in a pretzel bun would work, but not so much. It's nowhere near as tasty as the new pretzel burger at Wendy's. It reminds me much more of my first terrible experience with slimy pretzel bread. Maybe a better hot dog inside would have helped... Sonic also ignored my cinnasnacks order and we were missing a kid's meal toy. Oy. The only positive note from round 1? The new Strawberry Island Breeze Slush, it's like a coolatta but with real strawberry chunks. It was quite tasty and that's despite the fact that there was some coconut flavoring thrown in there. Round 2 is dessert time. 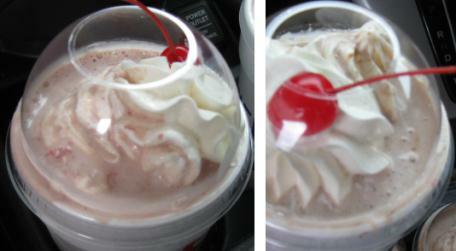 I've got the chocolate-covered strawberry shake on the left, my wife's chocolate cream pie shake on the right... I think I made the better call hehehe. It was really weird because the cream pie shake totally tasted like coconut to start (my wife said it first I swear!). she mixed it up a bit and she thought it faded a bit, but it was still there. Like I said, weird. My shake was tasty and used the same strawberry bits from the slushie. My only question was why the shake didn't seem colder (I know, sounds dumb doesn't it?). 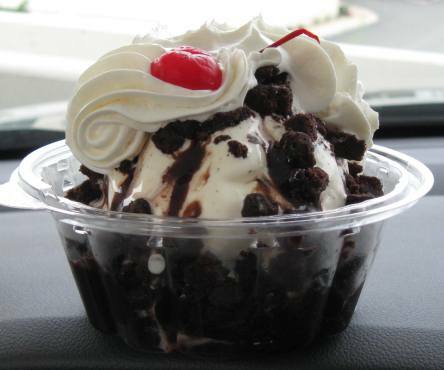 Ok, you already saw the Sonic Fudge Brownie Molten Cake Sundae up top and it was decent. It was a kind of dry and would need to actually be hot to be great, but it was still a fairly enjoyable treat that can easily be shared between two people (who are also drinking shakes anyway). Now my daughter went Oreo Blast as always, so that leaves just one more disaster to cover. Oh be still my beating heart.... hopefully I just got a terrible batch, but this is one of the worst things I've eaten in a long time. There is no way this is worth all the calories and fat it contains. Here's a better shot of the Sonic Cinnasnacks, but oh man, what a gigantic disappointment. I adore cinnamon so this should have been an easy win but it's terrible, just terrible. They probably weren't cooked correctly (stuck together), were probably overcooked, were chewy, flavorless (relatively speaking) and just a fail on every level. I was so unamused that I didn't even bother trying the dipping sauce. I choked one down and then went back to my sundae and shake. I would have sent these back had they not been free. So, that's that I guess. There were highlights in the shakes and slush, but I see the pretzel dog going away as well as the cinnasnacks. Sure they've both had a mix of good and bad reviews, but something that can be that far off is probably not going to stay around very long. Sonic doesn't do much of anything well, IMO. I got the chocolate cream pie shake as well and definitely tasted coconut. The Sonic lady told me that the coconut flavoring is what they use for all of the "cream" shakes (including banana cream and strawberry cream)...so if you don't like coconut, you probably should stay away from those shakes. It's weird; I know that Sonic supposedly uses real ice cream for their shakes, but they still taste pretty bad. My Sonic always has terrible service, but the food usually alternates between decent and pretty good. I love pretzel bun stuff, so the hot dog was a winner in my book. 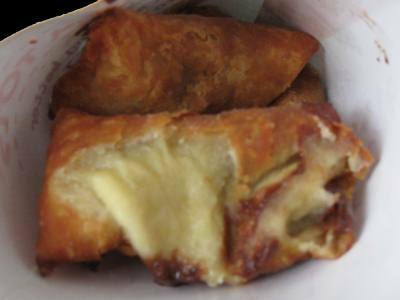 I was actually surprised that I preferred the mustard-only version to the cheese and bacon one. I actually really like their shakes. For one, they are one of the only fast food restaurants near me that had a Pumpkin shake, though apparently last season they didn't. I'm especially fond of the fact that their milkshakes run on the thinner side and I can actually drink them through a straw. My first experience with their big shake menu revamp was their Strawberry Cheesecake which tasted little like cheesecake and only slightly more like Strawberry. It was a disappointment to say the least. I then tried the Peanut Butter Banana shake and then the Peanut Butter Cookie shake and was pretty pleased with both. They both had a great PB flavor and you can actually see the remnants of blended Peanut Butter on the sides of the cup. My one big complaint is their "Whipped Cream" is awful. It tastes like having a big mouthful of Crisco. I noticed the other day that McDonald's seems to use real whipped cream so I don't see why Sonic can't. The "whipped cream" doesn't melt. I saw one left from Wednesday to Sunday and the "whipped cream" was still laying there in the bottom in a big glob. I noticed my stomach felt funny after having one of these. Just had a vanilla waffle cone from Sonic. On a scale of 1-10, it gets a 1. Why? Because the texture was kinda chalky, and it left a greasy film at the roof of my mouth, and it took a while for it to melt. When I got home, I dumped it in the sink. It took a while for it to melt in steamy hot water. I don't plan on ever getting anymore ice cream from Sonic ever again. It was HORRIBLE. A "lets try Sonic" experience, sorry we did. We each had a Shake, not a milk or ice cream Shake. It didn't melt so it wasn't ice cream of any kind. I thought it might be cake frosting of some kind, it holds it shape quite well and the stuff hasn't left the inside of the cup as it sits on the sink. 24 hours later. It was really BAD.